Authority Melts From Me is a suite for quintet, inspired by my respect for the Haitian people, who have persevered through a tragic history of colonialism, slavery, and foreign occupation. This suite focuses particularly on Haiti's slave revolt--the only successful slave rebellion in recorded history--which led to Haiti's declaration of independence from its colonial master, France, in 1804. On the eve of the slave insurrection in August 1791, leaders of the rebellion conducted a massive Vodou ceremony at Bois Caman in the northern mountains of the island to declare their intent to take over the Northern part of Haiti (then Saint Domingue). As Haitian scholar Madison Smart Bell writes: In Haitian Vodou, there is understood to be a great crossroads between the world of the living and the other world inhabited by the spirits of the dead. Vodou practitioners believe that the souls of the dead do not depart. Instead, they go into a parallel universe invisible to the living, but quite nearby and not impossible to reach. Traffic through this crossroads defines much of Vodousaint religious practice. In addition to a Vodou priest, Vodou drummers facilitate opening the gateway between the two worlds. I have selected music from two Vodou drumming ensembles: the Drummers of the Societe Absolument Guinin from Port au Prince, and the drummers from the community of Soukri, near the town of Gonaves, whose ceremony I had the great honor of attending and documenting in January 2012. Since distinct Vodou traditions have been preserved in specific communities for hundreds of years, these ensembles have unique lexicons. Following a period of immersion, careful transcription, and analysis, I composed a suite of music utilizing rhythms and concepts found in these two drumming ensembles. 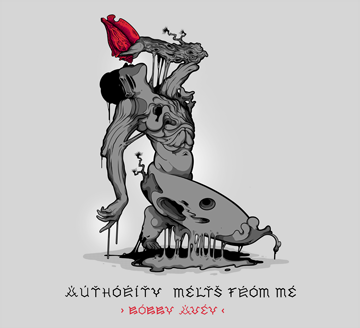 The result is Authority Melts From Me. The history of jazz has always been one of cultural variety and amalgamation of diverse traditions. I hope to be furthering that in a sensitive way by incorporating traditions of a county I respect. I hope to add something to the legacy of jazz that stays true to the aspirations of that music while incorporating a style that up until now has not been explored in this way. What I also hope is that this endeavor is creating further linkages in the relationships of the various branches of the African diasporic tradition. Authority Melts From Me has been made possible by the Chamber Music America 2011 New Jazz Works: Commissioning and Ensemble Development grant funded through the generosity of the Doris Duke Charitable Foundation.